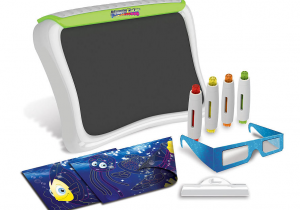 I first saw the Magna Color 3D Magnetic Design Station ($29.99, ToysRUs.com) at a conference last summer. It’s a neat little toy. Small dots are placed on the magnetic board with those pens you see pictured. Kids can design whatever they want, or they can use the pages that come with the toy to design already preset pictures. They can then put on the 3D glasses and the pictures are in 3D. Get the Magna Color 3D Magnetic Design Station on Toys R Us.com for $29.99. Disclaimer: I received a sample product of the Magna Color to facilitate this review. As always, all thoughts and opinions are my own.